Plate nineteen from the first volume of James Forbes' "Oriental Memoirs", a work based on copious notes and drawings made during his travels in India between the 1760s-70s. Forbes(1749-1819)spent most of his working life in Western India, particularly in Gujarat where he was employed as Collector in Bharuch and later in Dhaboi. His "Memoirs",in the form of a series of letters describing many aspects of life in India included ethnological studies. 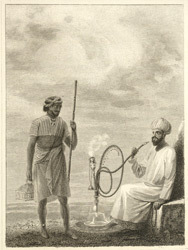 This is how he describes one such subject:'The sitting figure smoking the Hooka is a sciad, of a high Mahomedan family, claiming his descent from the prophet of the faithful. He is accosted by a Mahomedan fakir, or dervise, with his lark and staff, the usual accompaniment of those religious beggars; who, like the Hindoo mendicants, travels throughout Hindostan, living upon alms'.